The Rangers were unable to extend their win streak to nine games, after running into a hot goaltender and a surging Dallas team. Photo courtesy of Getty Images. The Rangers (19-11-4) could not extend their win streak any further, falling to a tough Dallas Stars (16-14-5) on the road by a final score of 3-2, their first loss since December 6th against the Red Wings. The first period had a total of four goals, with two for each team, and it appeared as if the game was headed for a high-scoring shootout. But a goal just 54 seconds into the second period sealed the win for the Stars, who have now won six of their last seven games. 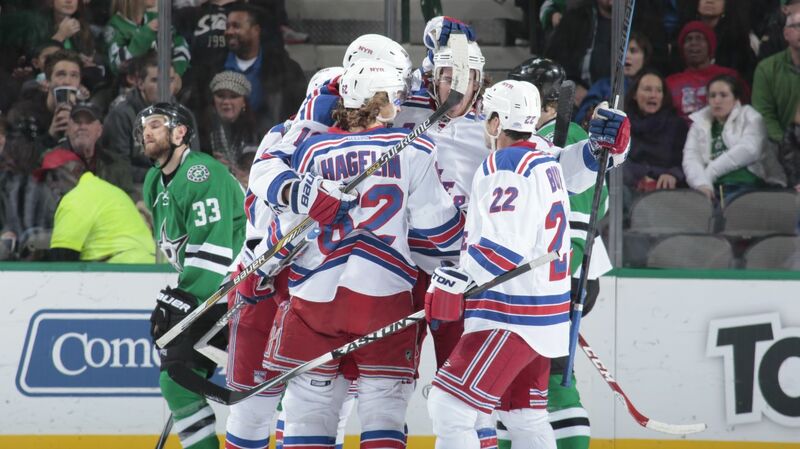 It was also the first time in eight games that the Rangers have allowed more than two goals. Henrik Lundqvist’s personal win streak was snapped at seven, and he made 23 saves on 26 shots. The game started out with both teams putting extreme pressure on both goaltenders. The Stars are a very offensive team, and that was very evident early on, as they did a great job getting pucks to the net. But it was the Rangers who broke through first, and JT Miller was the one to score for New York. After Chris Kreider used his speed to draw a hooking penalty, the Rangers went on the power play, which had been working well as of late. The Rangers celebrate JT Miller’s fifth goal of the season, continuing his strong play recently, as well as an assist that put Mats Zuccarello in the record books. Photo courtesy of Getty Images. And that trend continued, with Mats Zuccarello making a fantastic pass, hitting Miller in stride, who deposited it in the back of the net, continuing his red hot play. Ryan McDonagh had the other assist. Zuccarello’s assist give him 112 for his career, which also gives him the most points for a Norwegian born player in the NHL. JT Miller also stated his case for keeping a permanent spot in the lineup, scoring his fifth goal in his last 11 games since being recalled from Hartford. Miller was promoted to the third line later in the game, and should not be a healthy scratch again, at least for a long time. The Rangers lead did not last very long, when John Klingberg scored his fourth goal of the season on the power play after a Tanner Glass tripping penalty. Klingberg’s initial shot was blocked, breaking Dominic Moore’s stick, and his second shot got past a screened Lundqvist, tying the game at one. Six minutes later, Ales Hemsky scored a crazy goal. He threw the puck on net from a bad angle, which deflected off of Marc Staal’s stick and over the pad of Lundqvist, giving the Stars a 2-1 lead. But again, the lead did not last that long, with the Rangers answering back a minute later. Kevin Hayes scored his fifth goal of the season on a beautiful deflection off of Marc Staal’s slap shot. Dan Boyle had the secondary assist, and Hayes’ goal tied the game at two. Kevin Hayes scored the second goal of the game, and his fifth of the season. Hayes had not scored in a while, so hopefully this one, a gorgeous deflection, jump starts his play again. Photo courtesy of Getty Images. In the second period, Antoine Roussel would tap in a rebound for his eighth goal of the season, and recapturing the Stars one goal lead. Ryan Garbutt’s initian shot went wide, but took a lively bounce off of the boards, and Roussel was wide open for an easy goal. That would be the final goal of the game, and the Stars would eventually walk away with a 3-2 win, ending the Rangers win streak at an impressive eight games. 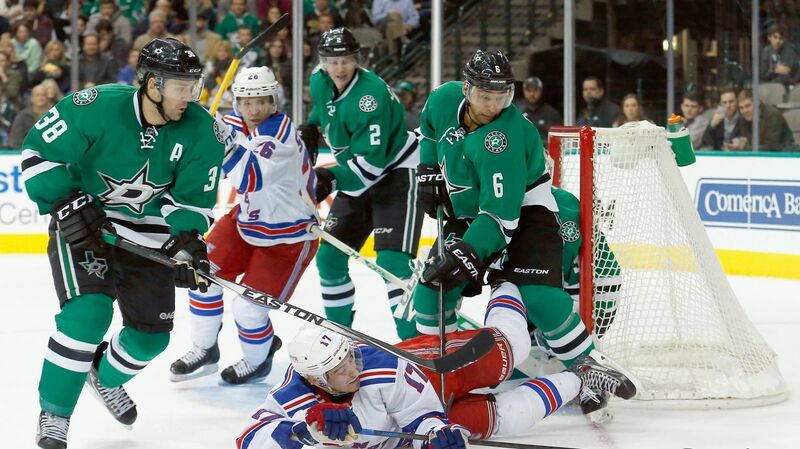 Apart from the strange second goal for the Stars, the Rangers played a strong game. Lundqvist made some very impressive saves in the second half of the game, and the defense was overall pretty strong from all six defensemen. Kari Lehtonen was the best player for the Stars, making numerous saves to keep his team ahead, most notably a left pad save on Dan Boyle late in the third period. He also made big time saves on Carl Hagelin rushing down the wing and on Derek Stepan’s wrister following a great toe drag move. Kevin Klein also came close, firing a slap shot off of the post in the third period. Lehtonen would finish the game with 28 saves. 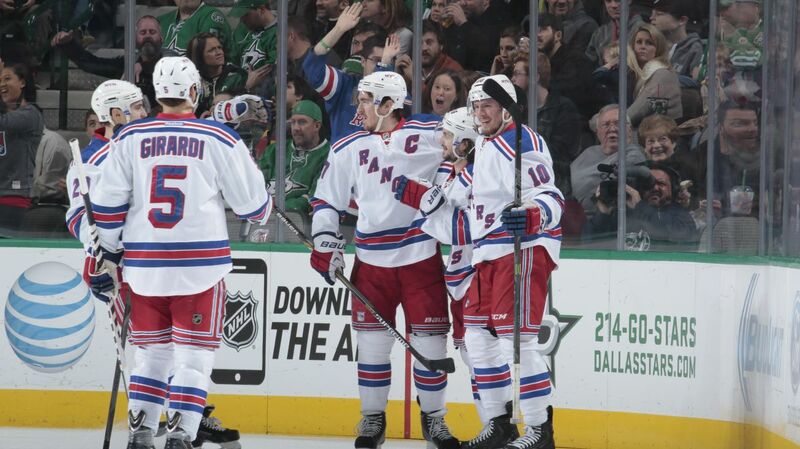 Rangers defensemen continue to contribute over the past nine or ten games. Ryan McDonagh, Marc Staal, and Dan Boyle all had an assist, making it 14 points (6-8-14) for Rangers defensemen over the last nine games. 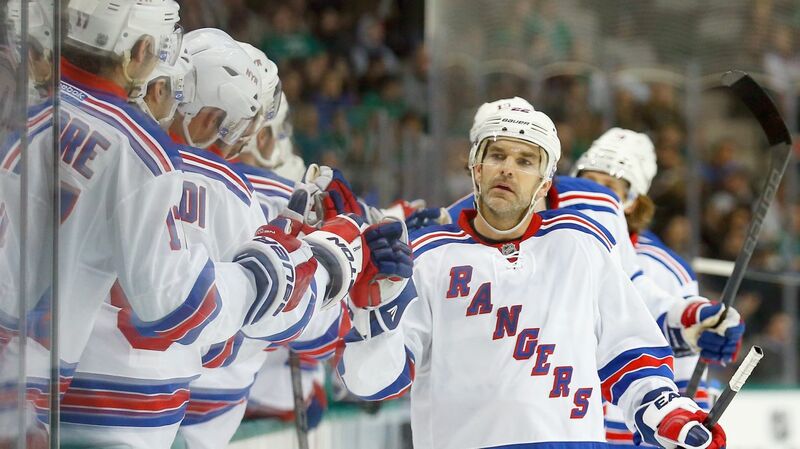 Dan Boyle also has a three game point streak, with all three points coming from assists. Rangers defensemen continue to contribute to the offensive game as well as playing strong defensively, putting up 14 points in the past nine games. Dan Boyle is also in the midst of a three game assist streak. Photo courtesy of Getty Images. JT Miller continues to play extremely well, and further showed why he deserves to be an everyday player for the Rangers, and is the hottest player on the Rangers. Miller played less than 10 minutes, but made a huge impact yet again. Tanner Glass did not have a good game, picking up two penalties in the game, one which led to a goal. He was a minus-one and did not really contribute at all. Vigneault may want to consider putting Stempniak and Fast on the bottom line, with Glass as a healthy scratch, because Miller deserves to be an everyday player. The Rangers next game will be on Wednesday against a solid Florida Panthers (16-9-8) team at the BB&T Center in Florida, and will be aiming to start a new win streak. It will also be the first time that brothers Kevin Hayes and Florida Panthers forward Jimmy Hayes play each other at the NHL level. Posted on December 30, 2014, in Game Recaps and tagged Aaron Ekblad, Alain Vigneault, Cam Talbot, Carl Hagelin, Chris Kreider, Dallas Stars, Dan Boyle, Dan Girardi, Derek Stepan, Derick Brassard, Dominic Moore, Florida Panthers, Henrik Lundqvist, Jesper Fast, Jimmy Hayes, John Moore, JT Miller, Kevin Hayes, Kevin Klein, King Henrik, Lee Stempniak, Madison Square Garden, Marc Staal, Martin St. Louis, Mats Zuccarello, Matt Hunwick, MSG, New York Rangers, NHL, NHL 2014-2015 Season, NY Rangers, NYR, Ovechkin, Rangers Nation, Rangerstown, Rick Nash, Roberto Luongo, Ryan McDonagh, The Ranger Zone, Tyler Seguin. Bookmark the permalink. Leave a comment.